This is my new stunner of a top from Newlook, an unusual mustard colour that admittedly I didnt think would suit me because of my pale skin and light hair but I really love it and recommend people trying out unusual colours this year! I contrasted the bright yellow with black Missguided wedges and a black Topshop bodycon and some gold and black Topshop earings to accessorise the look...what do you think? Stick to what you know or be a bit adventurous?? My best friend Lucie wearing a Topshop summer collection dress -£26. I love it, it looks gorgeous against your skin tone and hair. I think it'd look great with some chino, tapered style trousers, or some shorts. cool tunic Pippa!!!!! love it! and love duffy! You look stunning Pippa! It really goes so well with your pale skin, but I can see why you'd be vary at first- i'm very pale as well and have to be careful not to get lost (for example, I cannot wear grey! boohoo) haha! 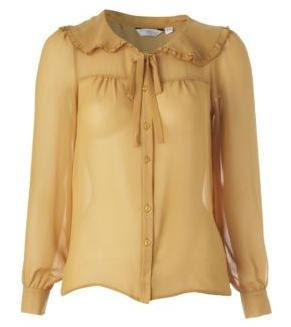 Gorgeous gorgeous gorgeous gorgeous blouse! Love it! Your ever so pretty :) New follower sweetie! Love love love that outfit! And you're stunning! Looking as good as ever! Love the NL blouse too! The blouse is such an enchanting color. Perfect for summery-breezes. your blouse is so cute!!! Lovely outfit! I love the earring! Um...your hair is pretty much the bomb. So wish my hair had the body and volume yours has! That colour suits you so well.